that is already delivering savings. BC loggers in the Terrace area say the provincial government should look at ways to help the region’s evolving forest industry and address the specific operating realities of the region, rather than take a cookie cutter approach. With $ 8 million in improvementsincluding a new wood waste-powered energy systemInterfor’s Adams Lake operation is well positioned for the future, and a new $100 million sawmill. 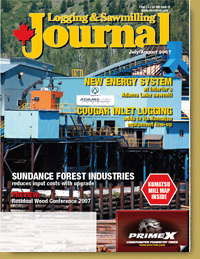 Alberta’s Sundance Forest Industries has recently invested $11 million to reduce its input costs andin a province with a labour crunchto further automate its operation. BC’s Cougar Inlet Logging recently took delivery of three new Komatsu machinestwo new log loaders and a roadbuilderand the equipment is living up to the high reputations established by its Komatsu predecessors. Century Wood Products works entirely with reclaimed wood, turning out flooring and other rustic looking wood products, and has developed a strong market for its product in Japan. Ontario’s Urban Tree Salvage is using urban wood from around the Toronto area to slice itself a piece of an increasingly environmentally conscious wood products market. very promising opportunities that are emerging for residual wood, especially in the biofuel area.